Artisan Poungtong crafts this unique necklace by hand. 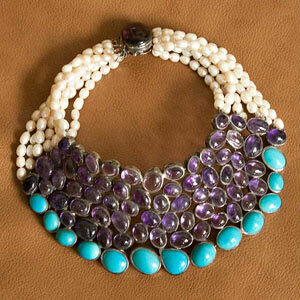 Featuring cultured freshwater pearls, amethyst and turquoise the captivating design fastens with a box clasp. A large amethyst piece is encased in the sterling silver clasp. The silver parts are designed to be tarnished. 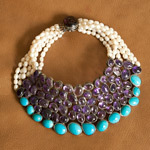 Materials: Amethyst, turquoise, cultured freshwater pearls and sterling (.925) silver.